A few weeks back the Property Council of Australia published research data reporting that the national vacancy rate in commercial properties fell from 10.9% down to 10.5 over the last financial year, continuing a steady four-year run in the 10-11 % range. This statistic alone certainly belies the disparities between our national office markets and sheds little light on the contrasting “pleasure and pain” dynamics within our commercial office markets. The Australian commercial office markets are in a total state of flux with far more than fine line disparities between our capital cities. While booming markets, supply decreases and stock reductions in Sydney and Melbourne have seen vacancy rates continue a downward trend to 5.9 % and 6.5 % respectively, the vacancy rates in Brisbane (15.7 %) and Perth (21.1 %) are still favouring those on the demand side of these office markets. As usual, unique local conditions are most certainly driving these markets. 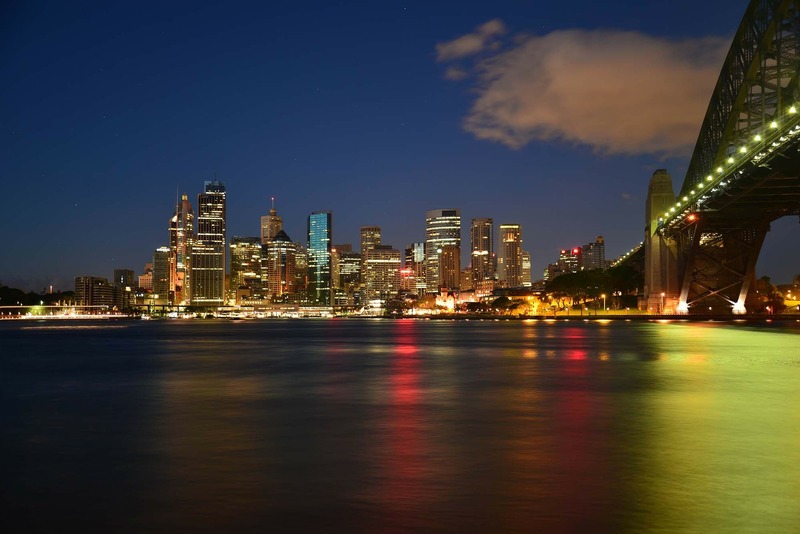 The ‘landlord-friendly’ market in Sydney means tenants need local knowledge and creative strategies to mitigate rental shock when addressing lease events (including expiries, renewals, assignment, and sub-lease opportunities). While in Melbourne, high rents remain coupled with high incentives as landlords attempt to capitalise on a short-term record low vacancy with little or no new stock being delivered in 2017 and 2018. On the other hand, however, the ‘tenant-friendly’ markets of Brisbane and Perth afford tenants’ significantly more property choice and scope for negotiating great lessor incentives. 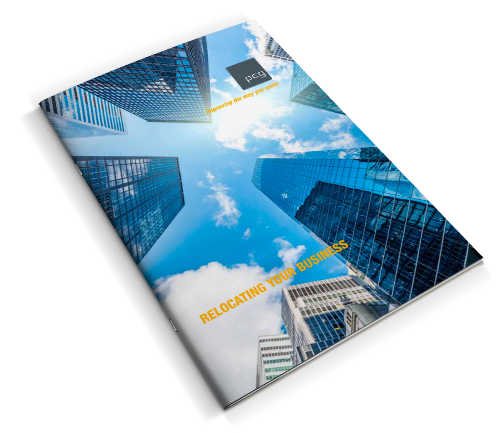 Now, more than ever, organisations need independent and professional tenant representation to navigate a favourable passage in local markets and utilise their expertise in negotiation to save time, mitigate risk, maximise savings and, ultimately, add to an organisation’s brand and structure. 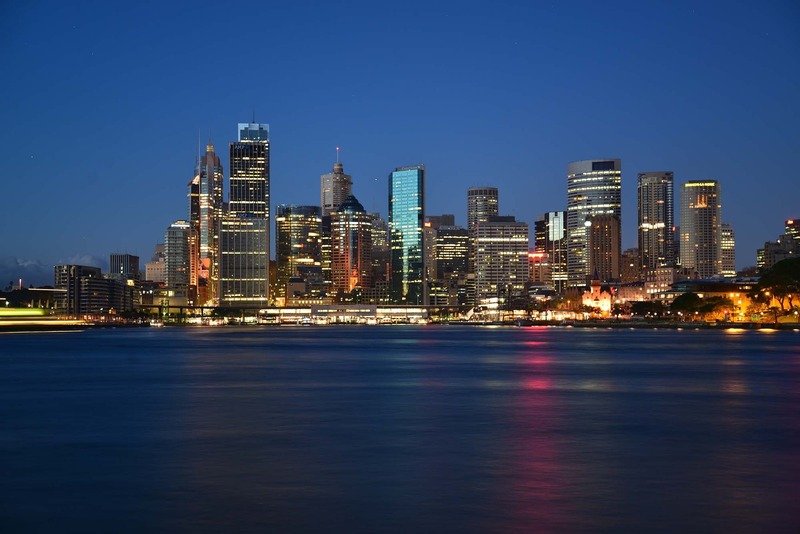 On the surface of things, the short-term commercial tenancy outlook in Sydney’s CBD may look a little bleak for tenants. Despite Barangaroo being ‘all but’ leased, the vacancy rate across the CBD still fell to 5.8 % from 6.2% over the last year, driven by a surge in multi sector demand, in particular the technology sector, and the reduction in stock due to the State Government acquiring buildings for the Sydney Metro, as well as many residential and hotel conversions – particularly in the lower grade stock end of the market. Landlords are trying to cash in on the boom: gross face rents increased by 8.8 % in the prime market and 10.6 % in the secondary market. With the supply of office space constrained over the next two years and a continuing robust demand for space anticipated, the upward trends on rents are projected in both the prime and secondary markets. In short, vacancy rates will continue to fall next year – to as low as 3.5 % - and fewer incentives offered to long-term tenants. New stock is expected to enter the market in late 2019 and tenants will be able to breathe a little easier. But for now, the unique commercial tenancy market is one where local knowledge is vital to figuring out accommodation stress. 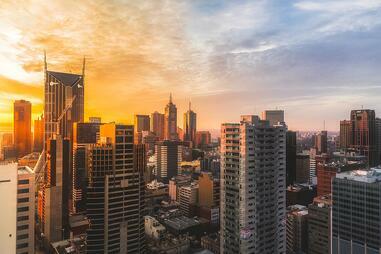 There are still plenty of options in the 1,000 sqm and 4,000 sqm range, as well as new spaces in Barangaroo. But the far-reaching ‘Barangaroo effect’ has opened vibrant short-term and sub-lease options to commercial tenants. With a flood of organisations moving to new offices in the Walsh Bay precinct, ‘lease-tails’ are being left in prime office spaces around town that can be snapped up in the short-term while vacancy rates remain below historical averages, and when vacancy rates begin an upward trend in 2019, longer term leases can be negotiated with incentives. So, there’s no need to stay put, give into high rents from aggressive landlords or agree to unfavourable leases: there’s great value in the short-term as refurbished ‘backfill’ spaces can be let with incentives. The story for small businesses and start-ups is a little different: office spaces in the sub-500 sqm range were leased swiftly and there are fewer options in Sydney’s CBD. It’s time to think outside the office and explore more creative solutions. Why not upgrade to a bigger space where there are more options and incentive-based tenancies? It wouldn’t even be more of a financial burden if you shared. No wonder co-work spaces have grown by 40 % per annum for the last ten years. Although the Melbourne commercial tenancy vacancy rate has dropped from 7.1 % to 6.5 % over the last year, commercial tenants might consider bucking the trend of “bunkering down” and explore incentives and, in the not-too-distant future, keep a finger on the pulse of an increase in office supply. The vacancy rate is expected to bottom out at 4.5 % by mid-2018 – led by low vacancy rates in the Docklands, Eastern Core and withdrawals at Southbank due to residential conversions - before an increase in capital expenditure brings new spaces to the market and, coupled with a wavering demand, will see vacancy rates begin an upward trend. For now, demand is outstripping supply: 109,640 sqm of new space entered the commercial tenancy market over the last financial year, yet vacant space decreased from 313,311 sqm to 295, 562 sqm. Landlords are trying to cash in on the booming market that has witnessed gross face rents increase by 13 %, and as much as 18 % in the premium market. They are competing for tenants’ business as they remain are all-too-aware that this a short-term market condition. While much of the limited development over the next twelve months is pre-committed, there’s a mooted 401,200 sqm of new office space coming on line between 2018 and 2020, led by developments in the Docklands. Incentives remain high at circa 31 %, as landlords attempt to lock in long-term deals before downward pressure on rents kicks in; as well as encourage movement in a market that has been relatively stagnant. For tenants, this means now is a favourable time to negotiate workplace fit-outs and refurbishments. While tenant movement in the plus-5,000 sqm property range has been constrained, there are plenty of options available right down through the area ranges. Although prime offices and secondary offices experienced 16 % and 13 % rental growths respectively, vacancy rates at the top-end of the market (in both premium and A-grade) have only dipped to 6.1 %. Much like the dynamic nature of businesses, Melbourne’s office leasing environment has become flexible and able to accommodate the needs of small businesses and start-ups. This has opened a diverse commercial tenancy market as landlords subdivide larger properties, tapping into a range of organisations needing smaller workplaces – all these organisations need is the knowledge of where they are, and a process of negotiation to make sure it’s a perfect fit for them. 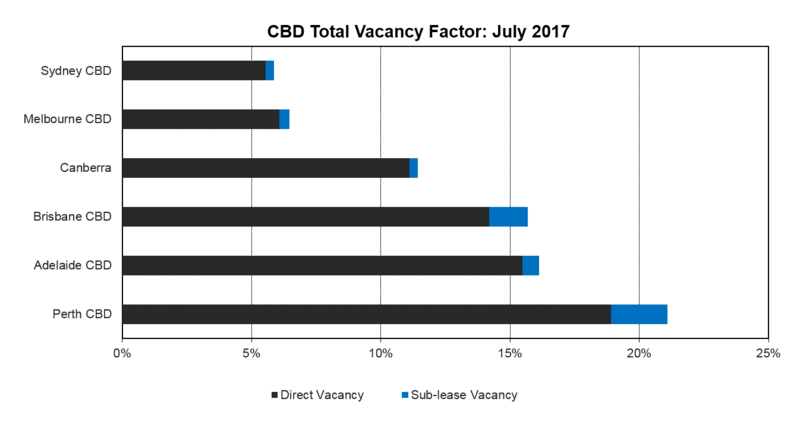 Brisbane is still in a period of significant oversupply and currently on an Australian Office Space market comparison is fourth on a National City CBD comparison, with the current combined vacancy rate in Brisbane sitting at 15.7 %. The net absorption to July 2017 had been 8, 299sqm whilst the future supply indicators are for 76,849sqm new office supply to be developed by 2019. Whilst the resource sector continues to show signs of a slow recovery particularly in QLD it is the professional services firms that are experiencing growth. The challenges existing in the Brisbane office market for each landlord is that the direct lease market is competing against the sublease market. 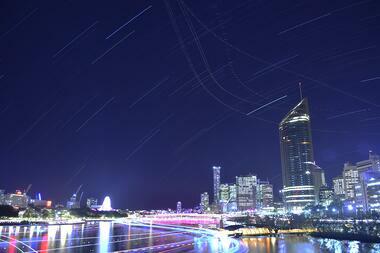 The Brisbane office market continues to remain tenant driven with incentives reaching near 40 %. PCG Brisbane has been involved in market transactions where Landlords are offering reduced rent, extended rent-free periods and generous capital contributions to activate vacant space. 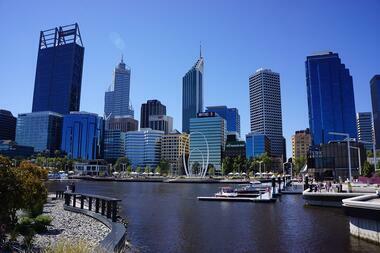 The office Leasing market in Perth is coming off the back of a lengthy period of development delivery and future construction pipeline softening has allowed it to stabilise in terms of office CBD vacancy. The Perth CBD office vacancy rate continues to climb due to negative demand for office space and more new office supplies. However, a lack of new office supply in the pipeline will help to stabilise the key CBD market in 2017. The Property Council of Australia Office Reports the net absorption for Perth Office sqm has been near 25,130sqm to the period of July 2017. This will continue as no major office project is being delivered in Perth in 2017 and the only large development committed for construction is the Capital Square project offering 48,484 sqm of new premium office space. The office market in Perth will continue to be a tenant driven market and experience similar levels of incentives that a market with over supply and high vacancy presents. Given the state of the nation, it is little wonder corporate real estate is presenting a puzzle for national tenants, whether start-up or high-end corporates, it’s no wonder that an estimated 80% of all commercial organisations engage the services of a professional tenant representative or corporate real estate consultant. Property is in most cases an organisation’s second-largest business expense and workplaces are constantly evolving to incorporate new technologies and changing industry benchmarks. A tenant representative brings local knowledge and explores lease options all-year-round - not just at lease expiry. The next two years is a unique time for the nation’s city office markets, with only half the average of historic supply mooted, and this is largely in Sydney and Melbourne. Whatever the environment an organisation finds itself in due to the demands of its business or trends in the local commercial tenancy market, a professional independent tenant representative is best equipped to develop and implement a strategy to secure a workplace solution to meet your needs.